We at Agape Distributors, LLC, are strong supporters of 4-H. In fact, we were 4-Hers ourselves! In February 2014 we selected several Adams County 4-Hers to receive SweetPro feed supplements and report back on their results with it! Read Emma’s update on her pig here. 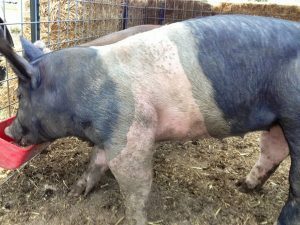 June 2014: My pig Minnie has been doing very well on the supplement. One of the difficulties I faced was making sure my other pig didn’t get it, but we figured it out. I’m noticing it’s improving her hair. It hasn’t ever really been bad but in my opinion it is looking and feeling better. Another thing I noticed was that her body is getting more filled out, and the muscle definition is evening out. She needs to have a bigger lion that’s more defined, and I think the supplement is helping. One of my favorite parts about pigs is seeing how they grow and change. She definitely looks different since she’s been on the product, and I’m looking forward to the finished product and how she’ll do at fair. 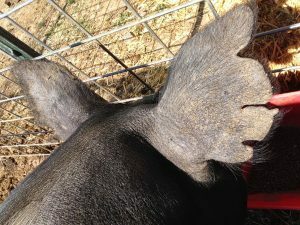 July 2014: Unfortunately, both of my naughty pigs ripped out their ear tags this year. One major thing I noticed is Minnie’s scar from where it did get torn out is significantly better looking than Oscar’s. Oscar’s scar doesn’t look terrible, but it’s definitely more noticeable than Minnie’s. Hers scarred up like her notching and healed faster than Oscar’s. That’s my favorite thing to have seen within this project. I’m happy hers looks good because she’s definitely my better-looking pig. August 2014: I finished showing Minnie the last day of July, and I had a lot of fun! 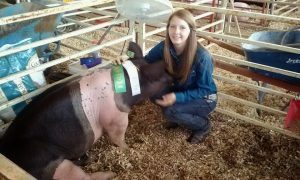 This was my first year doing showmanship, and we got penned and placed 6th! I was kind of surprised and very excited. Minnie weighed in at 280 lbs and got 3rd place in market. This year I had a lot of fun, and she sold for $1,100 without add-ons, which I thought was awesome because I was hoping for $700 or maybe $800 if I was lucky. I taught little kids how to show with Minnie, and they had fun and I thought it was fun to watch. We’re feeding my other pig out, and he’s looking better with the supplements. I really appreciate this opportunity, and I’m very thankful!